Occupational noise exposure is considered as the major risk factor of workplace that causes hearing loss in workers. It is defined as an impairment of hearing, resulting from exposure to excessive noise that manifests over a number of years and results in bilateral and symmetrical impairment of hearing. The cumulative permanent loss of hearing is always of the sensorineural type, which develops over months or years of hazardous noise exposure. Noise-induced hearing loss (NIHL) is one of the most leading occupational disease that contributes toward social isolation and leads to degraded quality of life. It is caused by the workplace noise exposure, mainly reported in developing countries. According to the World Health Organization (WHO), 16% of hearing loss in workers is due to occupational noise, ranging from 7 to 21% in various subregions [Figure 1]. Globally, 1,628,000 (in million) NIHL cases have been reported every year and the incidence rate is around two new cases out of 1000 older workers. Even though NIHL is preventable, it is one of the most important problems of the industry and considered as one of the 10 major occupational diseases. Asia is the world's largest and populated continent in the world that faces many challenges related to the occupational health and safety. NIHL in Asia shows complex scenario where rapid industrialization and economic growth occur in many developing countries. Noise management is an intricate task in various occupations. 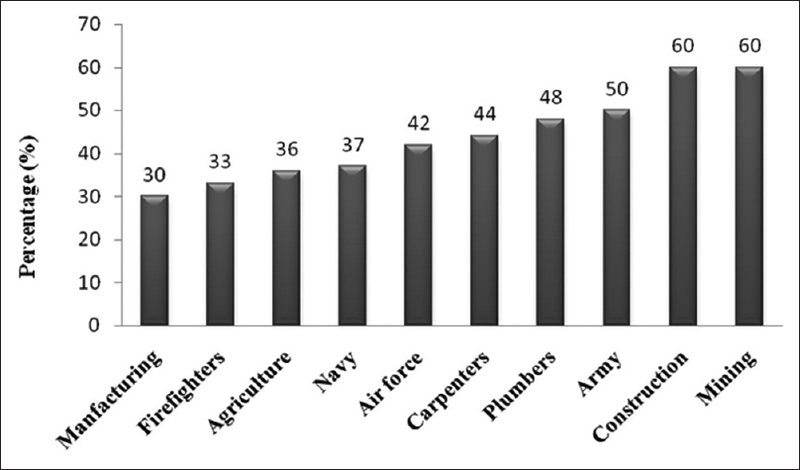 Several reports have shown the incidence rate of NIHL in different occupations. The workers in different industries such as mining, construction, printing, crushers, drop forging, iron, and steel companies are at high risk for severe hearing loss [Figure 2]. Almost all highest 60% of incidence rate of hearing loss was reported in mining and construction industry as compared to other occupations. Almost 15–20% of workers in mining industry are exposed to high level of noise at workplace, which ultimately leads to NIHL. In the mining industries, two out of three workers will have to suffer from hearing loss by the age of 50 years. In developing countries exposure to occupational and environmental noise is more as compared to developed countries because of lack of often effective legislation programs to prevent NIHL. Numerous studies have demonstrated links of acoustic trauma and metabolic exhaustion in the inner ear owing to continuous and impulsive noise stimulation. Prolonged noise exposure produce pathological effects in the cochlea with substantial damage to HCs of the inner ear. Scientists reported characteristics V-shaped notch typically noted as a “threshold dip”/“hearing notch&” at 4 and 6 kHz frequency on pure-tone audiometry testing as an indicator of NIHL. Majority of the literature considered 4 kHz as a standard notch to detect NIHL. Proteins present in the inner ear are disturbed by loud sound through multiple mechanisms such as loss of protein–protein interactions, aberrant accumulation, targeted degradation, mechanical damage, excitotoxicity, ischemia, metabolic exhaustion, ionic imbalance, etc., Specific proteins are identified with hearing loss-related dysfunction due to noise stimulations in the cochlea. Despite these findings, function of the cochlear proteins and its expression in NIHL is still not fully understood. Although animal studies have provided much of our understanding of cochlear protein expression but not extensively addressed in humans, the electronic database online literature searches related to NIHL in animal models as well as in human [Table 1] and [Table 2].,,,, There has been very little research reported on cochlear proteins which may be used as biomarkers for early detection of NIHL. Hence, this situation prompted to present this succinct review using the available literature on cochlear protein expression in NIHL. Extensive literature search was conducted in the following electronic databases, viz., PubMed, Cochrane Library, KoreaMed, Virtual Health Library, Audicus, IndMed, PakMediNet, Google, etc., using the MeSH terms such as noise, hearing loss, noise-induced hearing loss, cochlear proteins, expression of proteins during NIHL, biomarkers for NIHL, proteomics in NIHL, hearing impairment, sensorineural hearing loss, tinnitus (n = 101) with initial searches limited to materials available with complete abstracts (to govern the suitability for full-text retrieval) and those available in the English language were included. 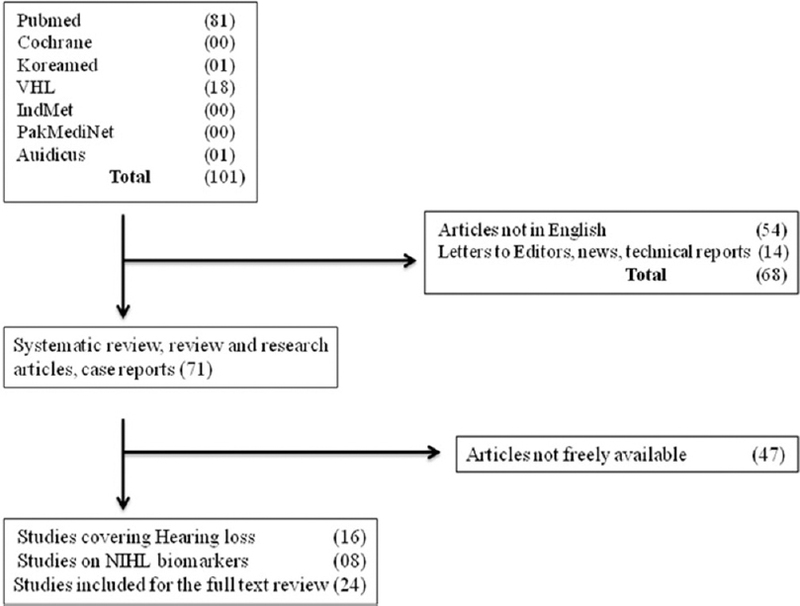 Systematic reviews, review and research articles, case reports related to NIHL (n = 71) extracted from the searched literatures was included. Opinions, news, letters to the editor, and articles merely describing about the techniques were excluded (n = 68) [Figure 4]. 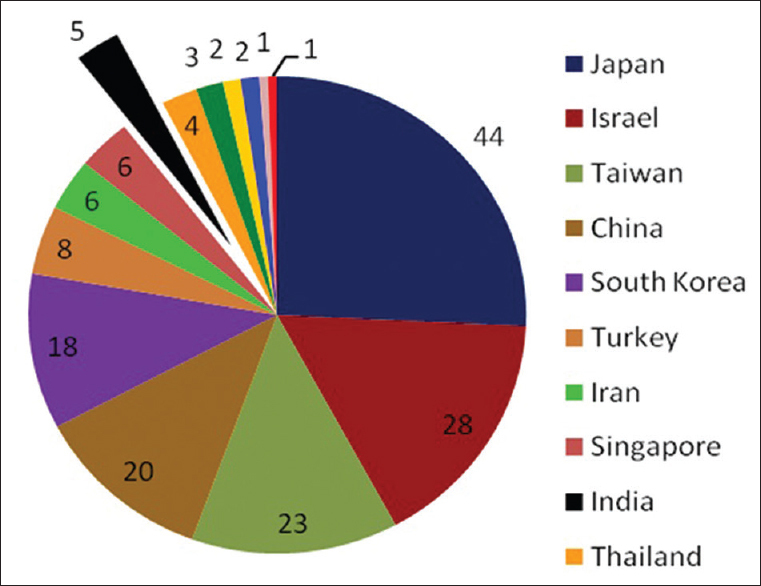 These reviews included the above electronic database online literature searches related to NIHL in animal models and human [Table 1] and [Table 2].,,,,,,,,,,,,,,,,,,,,,,,,,,, The information regarding numbers of publication on NIHL from Asian countries was obtained from ISI Web of Science [Figure 5]. According to the database, only five publications on NIHL were reported from India. 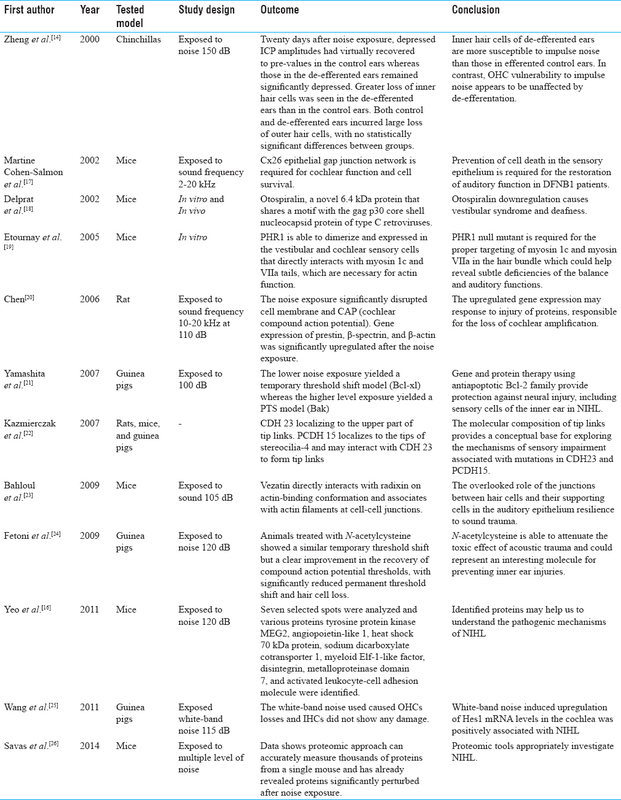 Information on cochlear proteins, biomarkers identified, subject population, technique used, different animal model used as well as sample collection and processing were also included in this review. On the basis of literature search, it was found that very limited information regarding cochlear proteins associated to NIHL. To the best of knowledge, in this review attempt was made to incorporate all those citations that may provide future insights to study the importance of cochlear proteins in NIHL. A significant first step toward the early identification of hearing loss after excessive sound induction is the detection of proteins and pathways perturbed within the micromachinery of the ear. 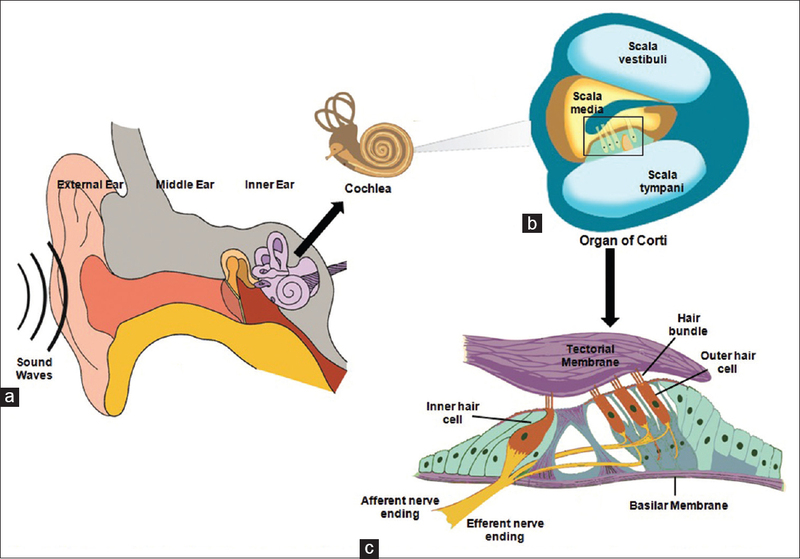 Several proteins present in TM, inner HCs (IHCs), outer HCs (OHCs), and stereocilia in the cochlea are responsible for hearing and loss of proteins cause NIHL. Cochlea and its structural integrity is maintained by myosins, transmembrane inner ear protein, otoferin, cadherin 23 (CDH 23), stereocilin, harmonin, protocadherin-15, radixin, whirlin, espin, prestin, worfferin wolframin, connexin 26 and 30, claudin 14, tricellulin, cochlin, collagen xi, alpha-tectorine [as mentioned in [Table 3]., Cochlear proteins overexpressed during occurrence of NIHL were included in the current review. The specific protein related to NIHL is described one by one as follows: TM proteins: alpha (α) tectorine and beta (β) tectorine. The TM is an extracellular matrix of the inner ear that covers the neuroepithelium of the cochlea and contacts the stereocilia bundles of specialized sensory HCs. Sound induces movement of these HCs relative to the TM, deflects the stereocilia, and leads to fluctuations in HC membrane potential, transducing sound into electrical signals. The presence of a hydrophobic C-terminus preceded by a potential cleavage site strongly suggests that tectorins are synthesized as glycosylphosphatidylinositol-linked, membrane-bound precursors. Tectorins are targeted to the apical surface of the inner ear epithelia by the lipid and proteolytically released into the extracellular compartment. Alpha and beta tectorins are important noncollagenous component of the TM. The alpha tectorine (TECTA) protein can form homomeric or heteromeric filaments after self-association or association with beta-tectorine (TECTB), respectively. Many different types of cells synthesize alpha-tectorine protein during development of the inner ear. Due to sequence of DNA in TECTA gene, it is assumed that tectorine protein is synthesized from a precursor adjacent to plasma membrane, via glycosylphosphatidylinositol, released from the membrane by proteolytic cleavage of precursor. Gene TECTA (23 exons), located in chromosome 11, codifies alpha-tectorine protein (2155 amino acids) and it is one of the components of TM. Mutations in gene cause two forms of autosomal dominant hearing loss (DFNA8 and DFNA12 – 11q22-24, both prelingual and they may be progressive and nonprogressive) and an autosomal recessive form (DFNB21 – 11q, prelingual, severe to profound). Mutation in TECTA gene is not fully understood, which produce an abnormally small protein by premature stop signal by instructions to alpha-tectorine protein. Small concentration of alpha-tectorine protein disturbs integrity of tectorine membrane required for conversion of sound to nerve impulses. The association between tectorine membrane proteins and NIHL has been well established. Alpha-tectorine, beta-tectorine, and otogelin are glycoproteins. These unique molecules from the inner ear have been associated with a moderate to severe deafness, which contacts the steriocilia bundles of specialized sensory HCs with extracellular matrix of the TM associated with pathophysiology of NIHL. Alpha-tectorine plays a vital role in the mechanism of hearing, changes in their expression due to prolonged noise exposure, and leads to hearing loss. Damage in the alpha- and beta-tectorine proteins can cause nonsyndromic, sensorineural, and moderate-to-severe degree of hearing loss. NIHL occurs due to damage in the organ of corti (OC), particularly IHCs and OHCs are affected. Although OHCs loss is considered as a major contributor for NIHL, hearing deficits are not closely correlated with OHCs damage, suggesting that the death of other cell type in the cochlea has significant role in the development of NIHL., Current study approach can be generalized to examine the targeting, interactions and activities of a wide variety of HC proteins. It reveals a great deal of new information about the HC proteins cadherin 23, harmonin, myosin XVa, espin, prestin, etc., which are crucial for HC structure and function. There are certain important proteins present in stereocilia and HCs, which overexpressed during NIHL are described in the following. Whirlin is a cytoplasmic PDZ domain containing protein that plays a role in elongation and maintenance of stereocilia, mechanosensory organelles located in HCs of the inner ear. Whirlin colocalizes with actin filaments and is primarily detected in cochlear HCs. It is an organizer of submembranous molecular complexes that controls and coordinates actin polymerization of stereocilia, especially in IHC and OHC. Hearing in mammals depends on the proper development of actin-filled stereocilia at the HC surface in the inner ear. Whirlin is expressed at stereocilial tips associated with hearing loss. It is connected to the dynamic Usher protein interactome and has a pleiotropic function in both the retina and the inner ear. Myosin XVa is a motor protein that associates with the second and third PDZ domain of whirlin through its C-terminal PDZ-ligand. Myosin XVa then delivers whirlin to the tips of stereocilia, which are subsequently elongated. p55 also interacts with whirlin, and mutations in DFNB31, the whirlin gene, leading to an early ablation of p55 labeling of stereocilia, which may cause recessive hearing loss in humans. Cadherin 23 represents the first in this family of calcium-binding proteins of which mutations in the extracellular calcium binding domain contributes to an inherited disorder, USH1D. Patients with USH1D exhibit congenital sensorineural hearing loss, vestibular dysfunction, and visual impairment due to early onset of retinitis pigmentosa. In the inner ear, cadherin 23 interacts with myosin VIIIa and harmonin to form a functional network during HC differentiation, and in the retina to assemble a supramolecular complex contributing to the organization of the cytoskeletal matrices of the pre- and postsynaptic region. A number of cadherin 23 splice variants exist in association with various phenotypic expressions, indicating that differential mutations result in variable presentation of the disease. The cadherin 23 protein is expressed in IHCs, OHCs, promoting strong adhesion in Reissner's membrane. It is important for delivering mechanical signals to the mechanoelectric transducer channels. It is one of the components of the tip link, which connects the top of shorter stereocilium to the sites of its taller neighbor. The average hearing loss is reported at 84.0 dB for CDH 23. Similar interacting proteins have been reported that include protocadhrein-15, harmonin, and MAGI-1. Protocadherin-15 binds to CDH 23 through its extracellular domain. MAGI-1 is a stereociliary scaffolding protein, whereas the cytoplasmic region of CDH 23 interacts with MAGI-1 and harmonin through its PDZ domain-binding interfaces. Alterations in cadherin 23 are known to cause moderate to profound high-frequency progressive sensorineural prelingual hearing loss. The connexin family of proteins forms hexameric complexes called “connexons” that facilitate movement of low molecular weight proteins between cells via gap junctions. Connexin proteins share a common topology of four transmembrane α-helical domains, two extracellular loops, a cytoplasmic loop, and cytoplasmic N and C termini. Many of the key functional differences arise from specific amino acid substitutions in the most highly conserved domains, the transmembrane and extracellular regions. There are 21 identified members of this protein, in the sequenced human genome, making the connexin gene family a wide-ranging membrane protein. The MW varies between 25 and 60 kDa and have an average length of 380 amino acids. The various connexins have been observed to combine into both homomeric and heteromeric gap junctions, each of which may exhibit different functional properties, including pore conductance, size selectivity, charge selectivity, voltage gating, chemical gating, etc., The association between connexin proteins and the inner ear cells is well documented. The abundant expression of connexins in the auditory system of the inner ear demonstrates their importance in the development and hearing process. The changes in connexins are associated with hearing loss, neurodegenerative disorders, and skin diseases. Tip links are thought to be an essential element of the mechanoelectrical transduction (MET) apparatus in sensory HCs of the inner ear. It helps in the conversion of mechanical stimuli arising from sound and head movements into electrochemical signals. The dynamic properties and molecular composition of tip links have been the subject of intense debate over the past two decades. Tip links proteins include cadherin 23, protocadhrein-15, harmonin, and MAGI-1. Cadherins belong to the family of calcium-dependent adhesion molecules that function to mediate cell–cell binding to the maintenance of structure and morphogenesis. It is also involved in stereocilia organization and hair bundle formation. The identification CDH 23 and PCDH 15 as constituents of the tip links and the molecular asymmetry formed by heterophilic interaction of these molecules provides novel opportunities for understanding MET at the molecular level, and for determining the extent to which defects in MET cause hearing impairment. MET is a key element in the transduction process, which is the mechanoelectric transducer apparatus located near the top of the stereocilium. Cations, mainly potassium and calcium, flow through MET channel and alter the membrane potential that pass signal to the brain., The molecules that form tip links have recently been identified, and the analysis of their properties has not only changed the view of MET but also suggests that tip link defects can cause hearing loss. Espins are more potent than other actin-bundling proteins at eliciting microvillar elongation, possibly owing to their high affinity for F-actin and their highly cooperative effects on actin filament twist. Collections of parallel actin-bundle containing finger-like protrusions that more closely resemble stereocilia in length affect the espin C terminal actin-bundling module and are associated with recessive deafness and vestibular dysfunction in humans. Ezrin–radixin–moesin (ERM) proteins are collectively composed of ezrin, radixin, and moesin and belong to the band 4.1 superfamily, whose members share a common N-terminal FERM domain. The ERM protein family has been proposed to play structural and regulatory roles in many plasma membrane-based processes, viz., transmembrane signaling, growth regulation, differentiation, and the determination of cell shape, adhesion, etc., by functioning as membrane–cytoskeletal crosslinkers in actin-rich cell surface structures. The ERM protein functions as a regulated cross-linkers in between the plasma membrane and F-actin in the underlying cytoskeleton. In human, the genes for the ERM proteins present on different chromosomes: radixin is on chromosome 11 (11 exons); ezrin is on chromosome 6 (13 exons); and moesin is on the X chromosome (12 exons), which produces ~80, ~82, and ~75 kDa proteins, respectively. Among ERM protein, ezrin and moesin display 74%, radixin and ezrin display 75%, and 81% protein sequence identity with radixin and moesin. Ezrin plays an essential role in microvillar generation and dynamics, which is confirmed by the knockout of the ezrin gene in mice and fruit fly. At the initial stage of the stereocilia development, ezrin localizes aberrantly to the stereocilia but later it will be replaced by the radixin. The loss of radixin cannot be fully compensated by the ezrin. The expression of moesin shows tissue specificity, and it is predominantly found in microvilli of endothelial cells. Radixin is actin and/or plasma membrane linking protein that anchors filaments to membrane. Occurrence of the radixin was determined by immunolabeling of HCs in fish, amphibians, birds, and mammals, and it was unveiled that the highest concentration of radixin was situated in the lower shaft of each stereocilium, just above its basal taper. In human, radixin protein is expressed in cochlear HCs, and it is also expressed in vestibular stereocilia with ezrin. Radixin deficiency may cause hearing impairment, mainly deafness. The expression of radixin is specifically found along with the length of stereocilia in both the organ of corti and in the vestibular system where it diminishes gradually in prevalence toward the stereociliary tip. Han et al. found that the knockout of the radixin gene (Rdx) in mouse is associated with early postnatal progressive degeneration of cochlear stereocilia and subsequent deafness. Claudin proteins are mainly located at the tight junction, where it act as ionic barriers between cells. Tight junction plays a crucial part in the normal hearing process in cochlear function because any mutations or lack of tight junction associated proteins, like claudin 9, 11, 14, and occluding, cause deafness in humans and/or mice. Out of 24 different mammal claudins, claudin-14 has been identified as an important molecule for normal hearing process, where it is expressed in the supporting cells in the organ of corti, OHCs and IHCs. Here it acts as a selective barrier between endolymph and perilymph., In humans, a nonsyndromic hearing loss (congenital deafness DFNB29) occurred predominantly in higher frequencies due to the mutations in the claudin-14 gene., A rapid degeneration of cochlear HCs is found in knockout mice for claudin-14 gene, which make mice deaf. Tricellulin protein belongs to tetramembrane-spanning TAMP family and is one of the constituents of tricellular tight junctions and barrier of tight junctions., With the help of immunofluorescence staining, it was observed that the tricellulin concentration at tricellular contacts is ubiquitous in various epithelial cells in tissues, and in the mouse organ of corti, tricellulin localizes specifically to the tricellular junctions., In humans, five different mutations are reported in TRIC gene, and that which encode tricellulin has been reported to cause autosomal recessive nonsyndromic deafness DFNB49. Kamitani et al. reported that mice having tricellulin-knockout (Tric-/-) or mutation in TRIC gene shows an early onset of progressive hearing loss without any other significant morphological changes in other organs, which are similar to the phenotype reported in human DFNB49. They also reported that cochlea of tricellulin-knockout mice developed normally, although they progress into functional and histological degeneration later. From this extensive literature survey, authors made an attempt to understand the proteins associated with the pathophysiology and their mechanism in NIHL. It is obvious that aforesaid proteins are involved in the protection of inner ear's structural integrity. It is noteworthy to mention that collectively all these proteins may be considered as biomarkers for the identification of NIHL at early stage. In addition, proteomic approach may provide more insights on protein expression and downregulation due to noise exposure. Comprehensive understanding of inner ear proteome will accelerate the biomarkers study of NIHL for prevention. All authors would like to acknowledge Ministry of Mines, Government of India for funding the project and to the Director, National Institute of Miners' Health for their constant support and guidance for this study. Anand Barapatre gratefully acknowledge the financial support by Science & Engineering Research Board - NPDF Fellowship (SERB, PDF/ 2016/1775/LS). Topilla E, Pyykko I, Starck J, Kaksonen R, Ishizaki H. Individual risk factors in the development of noise-induced hearing loss. Noise Health 2000;2:59-70. Robinson T, Whittaker J, Acharya A, Singh D, Smith M. Prevalence of noise-induced hearing loss among woodworkers in Nepal: A pilot study. Int J Occup Environ Health 2015;21:14-22. World Health Organization (WHO) report 2001. Available from www.who.int/quantifying_ehimpacts/global/ebdcountgroup/en/index.html 2001. [Last accessed on 2015 Jun 15]. Occupational Exposure to Noise: Evaluation, Prevention and Control: NIOSH Cooperative Agreement with WHO for 1994-1995. Available from: http://www.who.int/occupational_health/publications/noisebegin.pdf. [Last accessed on 2013 Nov 24]. Mcbride DI. Noise induced hearing loss and hearing conversation in mining: In depth review. Occup Med 2004;54:290-6. Aas S, Tronstad VT. Diffusion-Based Model for Noise Induced Hearing Loss Master of Science in Electronics thesis, Department of Electronics and Telecommunications. Norwegian University of Science and Technology; 2007. Fettiplace R, Hackney CM. The sensory and motor roles of auditory hair cells. Nat Rev Neurosci 2006;7:19-29. Harrison VR. The prevention of noise induced hearing loss in children: A review article. Int J Pediatr 2012;473541:13. Harding W, Baggot J, Bohne A. Height changes in the Organ of Corti after noise exposure. Hear Res 1992;63:26-36. Engstrom B, Flock A, Borg E. Ultrastructural studies of stereocilia in noise-exposed rabbits. Hear Res 1983;12:251-64. Zheng XY, Henderson D, Mcfadden, SL, Hu BH. The role of the cochlear efferent system in acquired resistance to noise-induced hearing loss. Hear Res 1997;104:191-203. Zheng XY, Mcfadden SL, Ding DL, Henderson D. Cochlear differentiation and impulse noise-induced acoustic trauma in the chinchilla. Hear Res 2000;144:187-95. Yeo KN, Yun SY, Kim WJ, Choi HS, Lim CG, Chung WJ. Proteomic analysis of the protein expression in the cochlea of noise-exposed mice. Korean J Audiol 2011;15:107-13. Cohen-Salmon M, Ott T, Michel V, Hardelin JP, Perfettini I, Eybalin M, et al. Targeted ablation of connexin26 in the inner ear epithelial gap junction network causes hearing impairment and cell death. Curr Biol 2002;12:1106-11. Delprat B, Boulanger A, Wang J, Beaudoin V, Guitton MJ, Ventéo S, et al. Downregulation of otospiralin, a novel inner ear protein, causes hair cell degeneration and deafness. J Neurosci 2002;22:1718-25. Etournay R, El-Amraoui A, Bahloul A, Blanchard S, Roux I, Pézeron G, et al. PHR1, an integral membrane protein of the inner ear sensory cells, directly interacts with myosin 1c and myosin VIIa. J Cell Sci 2005;118:2891-9. Chen GD. Prestin gene expression in the rat cochlea following intense noise exposure. Hear Res 2006;222:54-61. Yamashita D, Minami SB, Kanzaki S, Ogawa K, Miller JM. Bcl-2 genes regulate noise-induced hearing loss. J Neurosci Res 2008;86:920-8. Kazmierczak P, Sakaguchi H, Tokita J, Wilson-Kubalek EM, Milligan RA, Müller U, et al. Cadherin 23 and protocadherin 15 interact to form tip-link filaments in sensory hair cells. Nature 2007;449:87-91. Bahloul A, Simmler MC, Michel V, Leibovici M, Perfettini I, Roux I, et al. Vezatin, an integral membrane protein of adherens junctions, is required for the sound resilience of cochlear hair cells. EMBO Mol Med 2009;1:125-38. Fetoni AR, Ralli M, Sergi B, Parrilla C, Troiani D, Paludetti G. Protective effects of N-acetylcysteine on noise-induced hearing loss in guinea pigs. Acta Otorhinolaryngol Ital 2009;29:70-5. Wang B, Liu Y, Zhu X, Chi F, Zhang Y, Yang M. Up-regulation of cochlear Hes1 expression in response to noise exposure. Acta Neurobiol Exp 2011;71:256-62. Savas JN. Proteome biology of noise induced hearing loss. NIH Project Research portfolio Online Reporting Tools (RePORT). 2014 Available from: https://projectreporter.nih.gov/project_info_description.cfm?aid=8678358. [Last accessed on 2014 Jun 14]. Hong O. Hearing loss among operating engineers in American construction industry. Int Arch Occup Environ Health 2005;78:565-74. Kumar A, Mathur NN, Varghese M, Mohan D, Singh JK, Mahajan P. Effect of tractor driving on hearing loss in farmers in India. Am J Ind Med 2005;47:341-8. Van Eyken E, Van Laer L, Fransen E, Topsakal V, Hendrickx JJ, Demeester K, et al. The contribution of GJB2 (Connexin 26) 35delG to age-related hearing impairment and noise-induced hearing loss. Otol Neurotol 2007;28:970-5. Aslam JM, Aslam AM, Batool A. Effect of Noise Pollution on Hearing of Public Transport Drivers in Lahore City. Pak J Med Sci 2008;24:142-6. Thorne PR, Ameratunga SN, Stewart J, Reid N, Williams W, Purdy SC, et al. 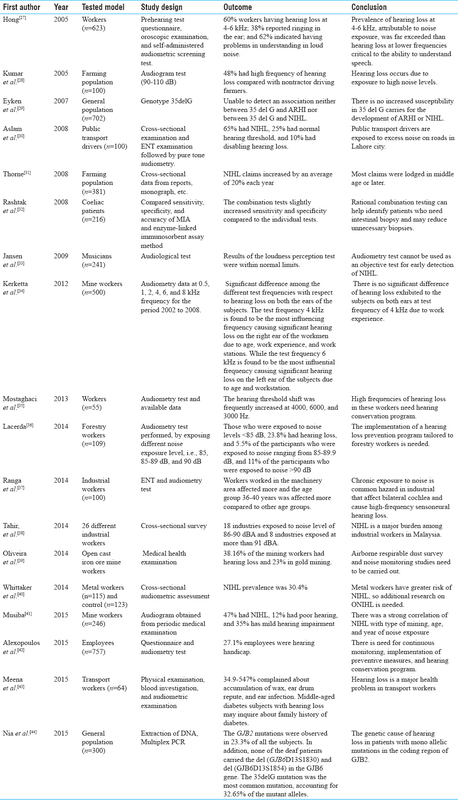 Epidemiology of noise-induced hearing loss in New Zealand. N Z Med J 2008;121:33-44. Rashtak S, Ettore MW, Homburger HA, Murray JA. Combination testing for antibodies in the diagnosis of coeliac disease: Comparison of multiplex immunoassay and ELISA methods. Aliment Pharmacol Ther 2008;28:805-13. Kerketta S, Gartia R, Bagh S. Occupational hearing loss of the workmen of an open cast chromite mines. Indian J Occup Environ Med 2012;16:18-21. Mostaghaci M, Mirmohammadi SJ, Mehrparvar AH, Bahaloo M, Mollasadeghi A, Davari MH. Effect of workplace noise on hearing ability in tile and ceramic industry workers in Iran: A 2-year follow-up study. ScientificWorldJournal 2013;2013:923731. Lacerda A, Quintiliano J, Lobato D, Gonçalves C, Marques J. Hearing profile of Brazilian forestry workers' noise exposure. Int Arch Otorhinolaryngol 2015;19:22-9. Ranga RK, Yadav S, Yadav A, Yadav N, Ranga SB. Prevalence of occupational noise induced hearing loss in industrial workers. Indian J Otol 2014;20:115-8. Tahir N, Syed AM, Jamal HH, Begum J. Burden of Noise Induced Hearing Loss among Manufacturing Industrial Workers in Malaysia. Iran J Publ Health 2014;43:148-53. Oliveira A, Cacodcar J, Motghare DD. Morbidity among iron ore mine workers in Goa. Indian J Public Health 2014;58:57-60. Whittaker JD, Robinson T, Acharya A, Singh D, Smith M. Noise-induced hearing loss in small-scale metal industry in Nepal. J Laryngol Otol 2014;128:871-80. Musiba Z. The prevalence of noise-induced hearing loss among Tanzanian miners. Occup Med 2015;65:386-90. Alexopoulos EC, Tsouvaltzidou T. Hearing loss in shipyard employees. Indian J Occup Environ Med 2015;19:14-8. Yadav M, Yadav KS, Netterwala A, Khan B, Desai NS. Noise-induced hearing loss (NIHL) and its correlation with audiometric observations in heavy vehicle operators suffering with metabolic disorders. Int J Med Clin Res 2015;6:0976-5549. Haghighat-Nia A, Keivani A, Nadeali Z, Fazel-Najafabadi E, Hosseinzadeh M, Salehi M. Mutation spectrum of autosomal recessive non-syndromic hearing loss in central Iran. Int J Pediatr Otorhinolaryngol 2015;79:1892-5. Thakkar LR, Pingle SK, Kumbhakar DV, Jawade AA, Tumane RG, Soni PN, et al. Expression of 16.2kDa protein in elderly population: A quest for the detection of age related hearing impairment. Indian J Otol 2015;21:248-53. 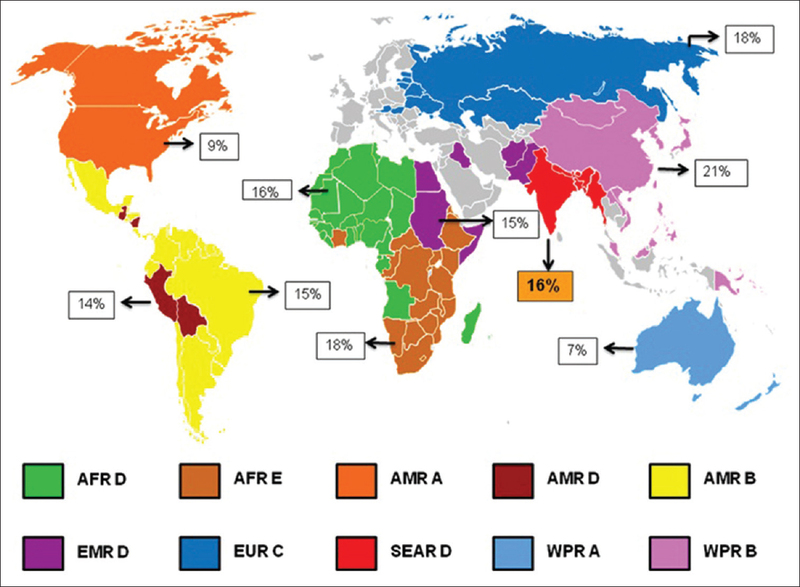 Fuente A, Hickson L. Noise-induced hearing loss in Asia. Int J Audiol 2011;50:S3-10. Piatto VB, Secches LV, Arroyo MAS, Lopes ACP, Maniglia JV. Nonsyndromic Deafness Molecular Update. Open Biol J 2009;2:80-90. Trivedi M, Pingle S. A review Noise Induced Hearing Loss (NIHL). Asiatic J Biotechnol Resources 2013;4:1-6. Verhoeven K, Van Laer L, Kirschhofer K, Legan PK, Hughes DC, Schatteman I, et al. Mutations in the human alpha-tectorin gene cause autosomal dominant non-syndromic hearing impairment. Nat Genet 1998;19:60-2. Meyer NC, Alasti F, Nishimura CJ. Identification of three novel TECTA mutations in Iranian families with autosomal recessive nonsyndromic hearing impairment at the DFNB21 locus. American J Med Genet 2007;143:1623-9. Liu XZ, Ouyang XM, Xia XJ, Zheng J, Pandya A, et al. Prestin, a cochlear motor protein, is defective in non-syndromic hearing loss. Hum Mol Genet 2003;12:1155-62. Dallos P, Fakler B. Prestin, a new type of motor protein. Nat Rev Mol Cell Bio 2002;3:104-11. Zheng J, Shen W, He DZ, Long KB, Madison LD, Dallos P. Prestin is the motor protein of cochlear outer hair cells. Nature 2000;405:149-55. Hakizimana P, Brownell EW, Jacob S, Fridberger A. Sound-induced length changes in outer hair cell Stereocilia. Nat Commun 2012;3:1094. Flock A, Cheung HC. Actin filaments in sensory hairs of inner ear receptor cells. J Cell Biol 1977;75:339-43. Mburu P, Mustapha M, Varela A, Weil D, El-Amraoui A, Holme RH, et al. Defects in whirlin, a PDZ domain molecule involved in steriocilia elongation, cause deafness in the whirler mouse and families with DFNB31. Nat Genet 2003;34:421-8. Ebermann I, Scholl HP, Charbel Issa P, Becirovic E, Lamprecht J, Jurklies B, et al. A novel gene for Usher syndrome type 2: Mutations in the long isoform of whirlin are associated with retinitis pigmentosa and sensorineural hearing loss. Hum Genet 2007;121:203-11. Boeda B, El-Amraoui A, Bahloul A, Goodyear R, Daviet L, et al. Myosin VIIa, harmonin and cadherin 23, three Usher I gene products that cooperate to shape the sensory hair cell bundle. EMBO J 2002;21:6689-99. Bork JM, Peters LM, Riazuddin S, Bernstein SL, Ahmed ZM, Ness SL, et al. Usher syndrome 1D and nonsyndromic autosomal recessive deafness DFNB12 are caused by allelic mutations of the novel cadherin-like gene CDH23. Am J Hum Genet 2001;68:26-37. Alagramam NK, Stepanyan R, Jamesdaniel S, Daniel HC, Davis RR. Noise exposure immediately activates cochlear mitogen-activated protein kinase signalling. Noise Health 2014;16:400-9. Sengupta S, George M, Miller KK, Naik K, Chou J, Cheatham AM, et al. EHD4 and CDH23 Are Interacting Partners in Cochlear Hair Cells. J Biol Chem 2009;284:20121-9. Muller DJ, Hand GM, Engel A, Sosinsky GE. Conformational changes in surface structures of isolated connexin 26 gap junctions. EMBO J 2002;21:3598-607. Kemperman HM, Hoefsloot HL, Cremers WRJ. Cor, Hearing loss and connexin 26. J R Soc Med 2002;95:171-7. Mukherjee M, Phadke SR, Mittal B Connexin 26 and autosomal recessive non-syndromic hearing loss. Indian J Hum Genet 2003;9:40-50. Hongzhe LI, Jawon K, Douglas V, Steyger P. Met channel- Independent uptake of aminoglycosides by cochlear hair cells. Ninth International conference on Molecular Biology of Hearing and Deafness. Stanford University; 2013;22-25. Stepanyan R, Indzhykulian A, Mclean J, Sinha G, Frolwnkov G. Acoustic overstimulation and mitochondrial Ca2+ overload in outer hair cells. Ninth International conference on Molecular Biology of Hearing and Deafness. Stanford University; 2013;22-25. Sensory Perception. Available from the source: http://cnx.org/contents/b375ea7d-22d5-4f47-b10a-41dd93637896@4. [Last accessed on 2015 May 15]. Sauvanet C, Wayt J, Pelaseyed T, Bretscher A, Structure, regulation, and functional diversity of microvilli on the apical domain of epithelial cells. Annu Rev Cell Dev Biol 2015;31:593-621. Hoeflic KP, Ikura M, Radixin: Cytoskeletal adopter and signaling protein. Int J Biochem Cell Biol 2004;36:2131-6. Ciuman RR. 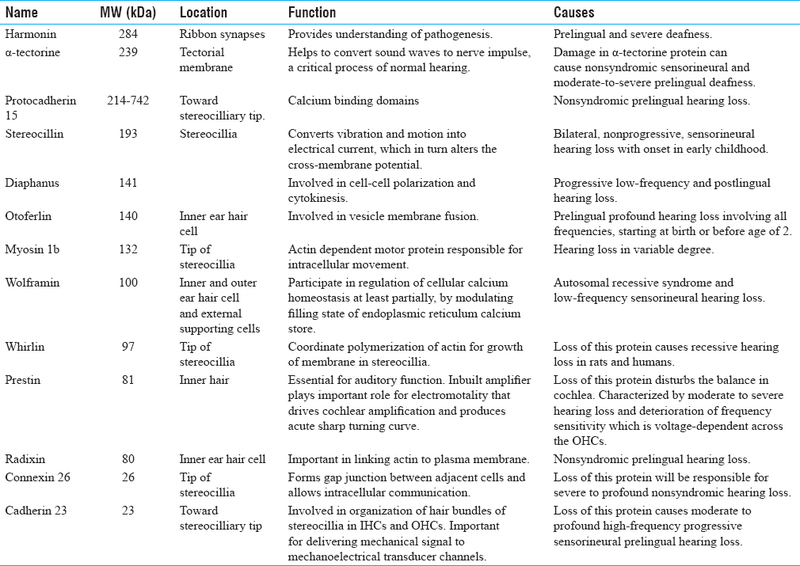 Auditory and vestibular hair cell stereocilia: Relationship between functionality and inner ear disease. J Laryngol Otol 2011;125:991-1003. Pataky F, Pironkova R, Hudspeth AJ. Radixin is a constituent of stereocilia in hair cells. PNAS 2004;101:2601-6. Peng AW, Salles FT, Pan B, Ricci AJ. Integrating the biophysical and molecular mechanisms of auditory hair cell mechanotransduction. Nat Commun 2011;2:523. Han Y, Wang X, Chen J, Sha SH. Noise-induced cochlear F-actin depolymerization is mediated via ROCK2/p-ERM signaling. J Neurochem 2015;133:617-28. Concetta A, Alessandro S, Lorenzo P, Francesca L, Katia P, Ramona T, et al. Wolfram Syndrome: New mutations, different phenotype. PLoS One 2011;7:e29150. Takei D, Ishihara H, Yamaguchi S, Yamada T, Tamura A, Katagiri H, et al. WFS1 protein modulates the free Ca2+ concentration in the endoplasmic reticulum. FEBS Lett 2006;580:5635-40. Noriomi S, Makoto H, Naoki O, Hideyuki O. Expression pattern of wolframin, the WFS1 (Wolfram syndrome-1 gene) product, in common marmoset (Callithrix jacchus) cochlea. Cell Mol Dev Neurosci 2016;1:833-6. Christine P, Eberhard F, Hans W. Expressional and functional studies of Wolframin, the gene function deficient in Wolfram syndrome, in mice and patient cells. Exp Gerontol 2005;40:671-8. Huihui X, Yang L, Guimei H, Rossiter SJ, Shuyi Z. Adaptive evolution of tight junction protein claudin-14 in echolocating whales. Gene 2013;530:208-14. Kamitani T, Sakaguchi H, Tamura A, Miyashita T, Yamazaki Y, Tokumasu R, et al. Deletion of tricellulin causes progressive hearing loss associated with degeneration of cochlear hair cells. Sci Rep 2015;5:1-5. Lal-Nag M, Morin PJ. The claudins. Genome Biol 2009;10:235.1-235.7. Wattenhofer M, Reymond A, Falciola V, Charollais A, Caille D, Borel C, et al. Different mechanisms precludemutant CLDN14 proteins from forming tight junctions in vitro. Hum Mutat 2005;25:543-9. Kitajiri S, Katsuno T. Tricellular tight junctions in the inner ear. Biomed Res Int 2016;6137541:1-5. Ben-Yosef T, Belyantseva IA, Saunders TL, Hughes ED, Kawamoto K, Itallie CMV, et al. Claudin 14 knockout mice, a model for autosomal recessive deafness DFNB29, are deaf due to cochlear hair cell degeneration. Hum Mol Genet 2003;12:2049-61. Riazuddin S1, Ahmed ZM, Fanning AS, Lagziel A, Kitajiri S, Ramzan K, et al. Tricellulin is a tight-junction protein necessary for hearing. Am J Hum Genet 2006;79:1040-51. Furuse M, Izumi Y, Oda Y, Higashi T, Iwamoto N. Molecular organization of tricellular tight junctions, Tissue Barriers 2014;2:e28960. Nayak G, Lee SI, Yousaf R, Edelmann SE, Trincot C, Van Itallie CM, et al. Tricellulin deficiency affects tight junction architecture and cochlear hair cells. J Clin Investig 2013;12:4036-49. Robertson NG, Hamaker SA, Patriub V, Aster JC, Morton CC. Subcellular localisation, secretion, and post-translational processing of normal cochlin, and of mutants causing the sensorineural deafness and vestibular disorder, DFNA9. J Med Genet 2003;40:479-86. Baek MJ, Park HM, Johnson JM, Altuntas CZ, Jane-Wit D, Jaini R, et al. Increased frequencies of cochlin-specific t cells in patients with autoimmune sensorineural hearing loss. J Immunol 2006;177:4203-10. Baruah P. Cochlin in autoimmune inner ear disease: Is the search for an inner ear autoantigen over?, Auris Nasus Larynx 2014;41:499-501. Asamura K, Abe S, Imamura Y, Aszodi A. Type IX collagen is crucial for normal hearing. Neuroscience 2005;132:493-500. Simmler MC, Cohen-Salmon M, El-Amraoui A, Guillaud L, Benichou JC, Petit C, et al. Targeted disruption of Otog results in deafness and severe imbalance. Nature Genet 2000;24:139-43. Cohen-Salmon M, El-Amraoui A, Leibovici M, Petit C. Otogelin: A glycoprotein specific to the acellular membranes of the inner ear. PNAS 1997;94:14450-5. Varga R, Kelley PM, Keats PJ, Starr A, Leal SM, Cohn E, et al. Non-syndromic recessive auditory neuropathy is the result of mutations in the otoferlin (OTOF) gene. J Med Genet 2003;40:45-50. Heidrych P, Zimmermann U, Kuhn S, Franz C, Engel J, Duncker SV, et al. Otoferlin interacts with myosin VI: Implications for maintenance of the basolateral synaptic structure of the inner hair cell. Hum Mol Genet 2009;18:2779-90. Al-Wardy NM, Al-Kindi MN, Al-Khabouri MJ, Tamimi Y, Camp GV. A novel missense mutation in the C2C domain of otoferlin causes profound hearing impairment in an Omani familywith auditory neuropathy. Saudi Med J 2016;37:1068-75. Frederick DG, Patricia MQ. Deciphering the Roles of C2-Domain-Containing Proteins (Synaptotagmins and Otoferlin) in the Inner Ear. J Neurosci 2011;31:4765-7. Ahmed ZM, Goodyear R, Riazuddin S, Lagziel A, Legan PK, Behra M, et al. The tip-link antigen, a protein associated with the transduction complex of sensory hair cells, is protocadherin-15. J Neurosci 2006;26:7022-34. Sotomayor M, Weihofen WA, Gaudet R, Corey DP. Structural determinants of cadherin-23 function in hearing and deafness, Neuron 2010;66:85-100. Jianchao L, Yunyun H, Qing L, Mingjie Z. Mechanistic basis of organization of the harmonin/ush1c-mediated brush border microvilli tip-link complex. Dev Cell 2016;36:179-89. Belyantseva IA, Perrin BJ, Sonnemann KJ, Zhu M, Stepanyan R, McGee J, et al. γ-actin is required for cytoskeletal maintenance but not development. PNAS 2009;106:9703-8. Michalski N, Petit C. Genetics of auditory mechano-electrical transduction, Pflugers Archiv Eur J Physiol 2014;467:49-72. Perrin BJ, Sonnemann KJ, Ervasti JM. β-Actin and γ-Actin are each dispensable for auditory hair cell development but required for stereocilia maintenance. PLoS Genet 2010;6:1-12.